Turbary Woods Owl And Bird Sanctuary: Some useful help and information regarding Owls and Birds of Prey. Some brief intructions on what to do if you find an injured Owl or other Bird of Prey. Minimising stress is the prerequisite of effective first aid - more birds are killed by shock than their injuries! So, whatever you do, swift action is a prime necessity as any delay increases stress. If you are actually able to approach and pick up an injured wild Owl or Bird of Prey, it is likely that it is in a very poor state indeed, and will further be traumatised by being handled! Never attempt to examine any injured bird yourself as this is also very stressful and requires a trained rehabilitator or vet to do this correctly! Tawny Owls live mainly in wooded areas, but they will also nest in suburban gardens. Often they will use holes in trees as nests rather than building their own, sometimes using old squirrel drays. They have also been known to use the disused nests of other birds and will also nest on the ground, if no other suitable nest sites are available. Usually, they will start laying their eggs around the middle of March, the incubation period is between 28 to 30 days, so the young generally are hatched mid-April. 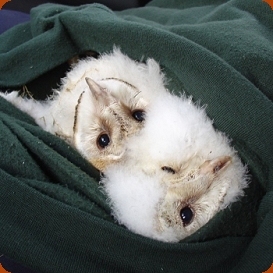 It takes about 5 weeks from hatching before the young are capable of flying, but a week or so before this time the owlets will start exploring the world outside the nest, this behaviour is known as "branching". This is probably the most frequent question asked of wildlife rehabilitators. It is also the hardest to answer. It is difficult to explain in a few concise sentences. The truth is the profession is relatively new on the scene and is still struggling to come up with its own description. The hawk board is currently working with D.E.F.R.A in setting up standards and guidelines for all raptor centre's and sanctuaries. Wildlife rehabilitators wear many hats. 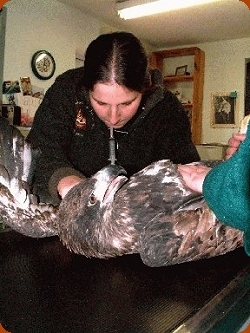 During the course of a single day wildlife rehabilitators function as animal caretakers, nutritionists, behaviourists, emergency medical technicians, naturalists, natural historians, educators, secretaries, animal housing specialists, capture and transport specialists for injured wildlife, and record keepers, providers of legal expertise and assist the public with wildlife issues. We do not get financial assistance from the government. 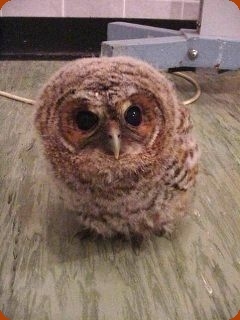 In fact, most wildlife centres are self supported or supported by donations only. It is a mistake to assume that wildlife rehabilitators are all veterinarians. That is not the case. It is also true that most veterinarians, unless they are wildlife veterinarians, are not wildlife rehabilitators nor are they equipped to handle wild species. Wild animals have very different needs than domestic animals. The focus on caring for wild species is to keep them wild so they will return to the wild. Everything from handling to housing and food offered is specific to the individual species.